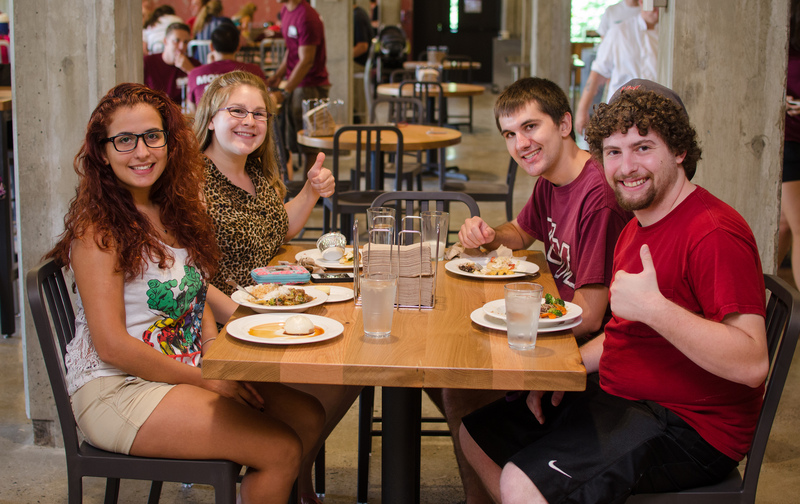 Three of the four Dining Commons (DCs) on campus are open 7 days a week throughout the summer, offering full menus and open doors to anyone interested in dining with us. Each Dining Common is equipped with a gluten-free station, vegetarian station, extensive salad bar, and so much more of your favorite award winning cuisine! If you’re looking for convenience, we have you covered. UMass Dining has several dining locations across campus that are sure to meet your needs this summer. Blue Wall, a campus favorite, is open for breakfast, lunch, and dinner all summer long! With over 10 + original dining concepts ranging from fresh salads to authentic Japanese cuisine, Blue Wall’s centralized location is perfect for sit down meals or dining on-the-go! Another centrally located eatery, Harvest is bound to be your grab n’ go option in the summer months. Check out the smoothie station for a cool, refreshing snack or build your own meal at the a la carte hot bar. The University Club & Restaurant offers everything from relaxed sit-down meals in the historic Boltwood-Stockbridge House to drinks and light fare at the bar. Check out the summer menu online at http://www.umassuclub.com/menus/ & call (413) 545-2551 to make a reservation. Whether you’re looking for a baked good and a coffee to get you started or a fresh-pressed Panini for lunch, Concourse People’s Organic Coffee is bound to have your fix in a convenient, easy to access location. Whitmore Café is your stop to find hot soup, fresh wraps, an extensive salad bar, and more! Don’t forget that Whitmore Café also serves People’s Organic Coffee when you need that extra pick-me-up. When you stop by the library this summer, don’t forget to cool down at the Procrastination Station! Alongside delicious coffee and espresso-based drinks, you’ll also be able to find all-natural sandwiches, salads, and more. The Courtside Café is located on the second floor of the UMass Amherst Recreation Center. Alongside offerings of snacks, fresh drinks, and smoothies to finish off your workout, the Courtside Café also offers Grab n’ Go sandwiches and salads! Conveniently located in the Integrated Science Building, the ISB Café offers Starbucks coffee, baked goods, and full meals to keep you refreshed and satiated all day long. Need to make a quick stop on campus? You’re in luck! UMass Markets are open all summer to fulfill those one-stop shop needs. No matter your dining preference this summer, we have you covered. UMass Dining is open and ready to serve you the healthy, sustainable, and delicious cuisine inspired by recipes from all over the world! For more information on Dining Operations, check out the Summer Hours flyer.